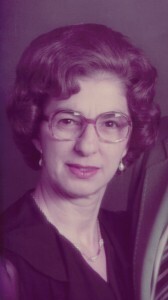 Frances Tomassoni Baczkowski, 81, of Warren, PA. died April 28, 2012 at her residence after suffering an apparent heart attack. She was born September 3, 1930 in Warren, PA. to the late Tomasso and Victoria F. Brindis Tomassoni. She was a lifelong resident of Warren and a 1948 graduate of Warren High School. Fran was employed as a waitress for many years and retired from Blair Corporation after 19 ½ years service. She was a member of St. Joseph R.C. Church, where she was a former member of the Altar Rosary Society and had served as a Lector. She was also a member of the church cursillo movement. Fran is remembered by family as a woman of much love and concern, who loved her nieces and nephews more as a mother figure, than as an Aunt. She is survived by her 3 brothers – Tony F. Tomassoni and his wife, Alice, Charles J. Tomasone and his wife, Alice and Nick S. Tomassoni all of Warren, PA., several nieces and nephews also survive. In addition to her parents, she was preceded in death by her husband of 24 years, Edward J. Baczkowski whom she married May 1, 1965 in Warren, PA. who died July 26, 1989, 1 Brother – Nick Tomassoni in 1929, 3 Sisters – Rose Tomassoni in 1932, Anna Jean McNitt, Mary Weidner. Friends may call at the Donald E. Lewis Funeral Home, Inc., 304 East Street, Warren, PA. on Monday from 6 to 8 P.M.
i have known fran most of my life and she was a wonderful woman to know . my life is better for having known her, she will be missed by her family and friends. words can not begin to express my codolances to the family i will keep her in my prayers an thoughts as well as the family i am truly sorry for the loss.